You can serve this curry with the accompaniments of your choice. I served it with some beautiful Pilau Cauliflower Rice. I simply popped the riced cauliflower on a heated greased baking tray, sprinkled it with Swartz Pilau seasoning and put in the oven on 180c for the last 10 minutes that the curry was cooking. This lovely 0sp rice alternative means you have enough points left over for a Weight Watchers Garlic and Coriander Naan Bread (4sp). That’s a whole Indian meal for only 5sp!! If you are having a dinner party, you can also make this curry as part of an Indian feast. I started my feast off with some 0sp Indian Onion Salad (recipe below), Rathia (0% fat Greek yoghurt mixed with ¼ tsp mint sauce, ¼ cumin and juice of ½ lemon) and Mango Chutney with 1 poppadum per person. I then served the curry as the main with some cauliflower rice, normal pilau rice for the non Weight Watching boys (long grain rice cooked with chicken stock and pilau seasoning as in the picture above) and some of my lovely Saag Aloo (2sp) which goes with this curry perfectly. Pan 1 – Begin by making the paste. Take a large frying pan, spray with 1kal and bring to a medium heat. Fry the garlic, ginger, chilli, ground coriander, paprika and turmeric for a minute or two to release the flavours. Add a little water to stop the mixture sticking to the pan. Then add the onions and fry for around 10 minutes (until the onions are nice and soft). Add the tomatoes and 250ml of water and then simmer on a low heat for half an hour. The paste should get thicker with the water evaporating away. Pan 2 – While the paste is simmering in the first pan, spray another large pan with 1kal and fry the onion, garlic, pepper, ginger, cumin and ground coriander for 10 minutes until the onions have started to soften. Add a little water to stop the mixture sticking to the pan if necessary. Next, take the paste from the first pan and add to the second pan. Then add the chicken stock, cinnamon, cayenne pepper, crushed chillies, bay leaf, tomato puree, white wine vinegar, sugar and salt to the second . Give everything a good mix to combine together and then add the raw chicken, covering in the sauce. Everything should now be in one pan. Simmer the sauce for 20 minutes until the chicken is cooked through and then add the fresh coriander (reserve a little to dress) and lemon. Stir and simmer for another 10 minutes until the curry has reduced and is nice and thick and velvety. Garnish with a little more fresh coriander. Serve with the accompaniments of your choice. Hi Laura….is the receipe 1 tsp of coriander, 1tsp turmeric etc or is it 1 tsp of them mixed. hi what a great recipe, i added some pineapple juice and a ring to my recipe near the end and it gave a Dansak taste to it. not sure what the points would be with that added? Another amazing meal from you. It was easy to follow & make. Scrumptious. Are the 2smart points without the chicken? Myself and my husband are addicted to this recipe and it has really helped us on our weightloss. Thanks so much. Ah that’s great to hear Janet, I love it as it totally gets rid of my craving for a takeaway! Just found this recipe and can’t wait to make it- can’t believe it is only 2spts! If I want to make it less spicy, do I just miss out the chillies? Thanks! I’ve put all the ingredients in my slow cooker for easy Friday night dinner for when I get home from work. My OH has just got home and says it smells amazing! Hope you enjoyed it Debbie, I might have to give it a try in the slow cooker! We all really enjoyed this recipe this evening. My husband said it was as close to a takeaway as you can get. We made this recipe last night- absolutely amazing! 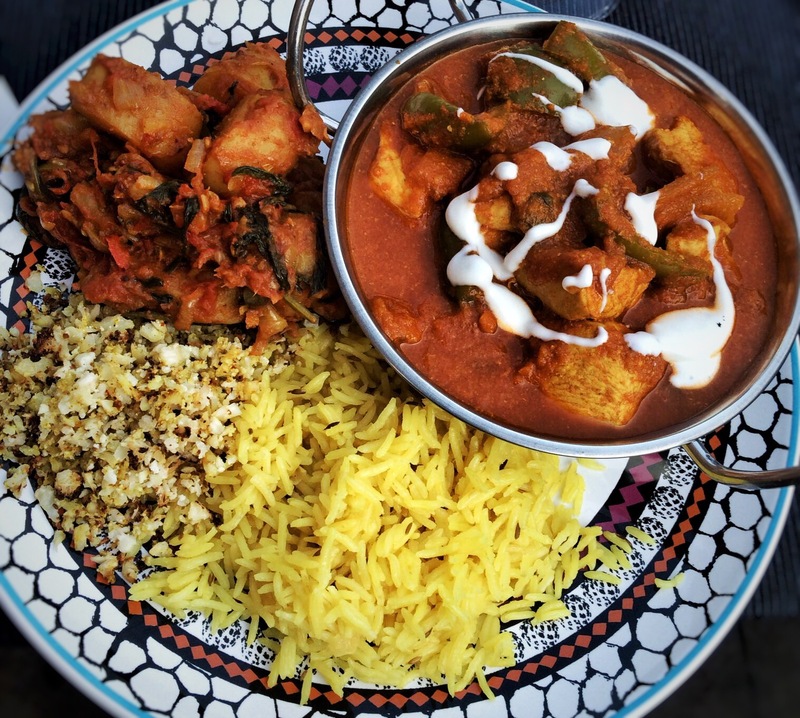 We also made the onion bhaji (another SKS recipe) as a side and served with a half rice/ half cauli rice mix – felt like I was in an Indian restaurant and a serious treat but all for a total of 7sp! Crazy! Will be eating time and time again! Thanks so much for sharing! Just had this meal – absolutely gorgeous!! So flavoursome. My husband said it was the best curry he has ever had! Will definitely be regular recipe in our house. Thank you! So pleased you enjoyed it!!! Ah so pleased you both liked it Donna, great to get your son involved too!! My husband made this for us last night and whilst time consuming, it was absolutely delicious. Thank you so much and please please please keep coming up with these fabulous low point recipes – they make losing weight so easy. So pleased you enjoyed Amber!! Made this curry for supper on Tuesday …… OH and I went out for a few drinks ….. Returned to find half the chicken out of our curry was missing 😩 My girls are very fussy eaters (it couldn’t be them) or could it ? Haha I love this Caroline! Pleased it went down so well and hope you managed to get some in the end! I’m looking at the salad and wondering what you mean by mint sauce and where would I get in in the grocery store? I’m new to the UK, from Canada, and it’s funny how many differences there are, especially when shopping! Your recipe saved me tonight, my dinner was 1 of 2 halves, started as mushroom & chickpea curry from the latest WW mag, result was very bitter not great tasting at all, the ingredients were similar but not as comprehensive as yours so I started with WW & turned it into your Pathia adding 1 chicken breast… it was a taste sensation served with an unfolded flatbread smeared with garlic, Bertolli light , coriander salt & lemon mmm mmmm mmm! We absolutely loved this pathia, but when I added this recipe into my meals on my WW app it came out at 4sp. I checked again and the 800 grams of chicken required came out at 12sp then the sugar and tomato purée would add extra sp. I must say we have had 6 or 7 of your recipes and everyone has been a great success. I was running out of steam with my weight loss but you have motivated me to stick at it with your recipes. Please ignore my comment regarding the points value of the chicken, I have just double checked and I have made a mistake saying it was 12 points. No problem Denise, glad you got it sorted 🙂 hope you are well! Thank you Laura, this was divine!! Hi Laura, love this recipe so much! Was going to make this for a vegetarian dinner party on the wknd and wondered if you had any suggestions for tweaking this? Would you add anything more to make veg or just leave out the chicken? Would I be able to cook this in a slow cooker? Always make this recipe as it is so delicious 😋 I’ve converted to flex too And it is saying on my app that it is 3sp for whole portion and 1sp for individual portion when divided by 4. The points are 2 for the sugar and 1 for the chicken stock cube.just wanted to share with you. Have made this for this evening along with your onion bhaji’s and is smelling fantastic. Just had a quick try and absolutely yummy. Can’t wait to try the next recipe. The recipe is a little confusing. You are talking about 2 pastes in the method. One with chicken stock and the other that we started off with. Can you tell me when I’m supposed to add the tomato based one? Had tonight. Husband said the best curry I have made. I do try many recipes. He said I can make this one again. Well done you .I always recommend your app to others. It’s really worth getting the Indian bay leaves for this, (Tej patta) they add a really authentic taste and smell wonderful. I am making this for a dinner party meal tomorrow. I can’t find your saag aloo receipe ? I made this last weekend and absolutely loved it! My husband said it was better than an Indian takeaway. So tasty. I Will be making again this week but doubling up and freezing a couple of portions. Thanks for sharing the recipe! Does the paste ingredients have to be blended to a smooth paste or left as it is? Made this tonight and it was delicious will defo be making again thanks for sharing your recipe. So glad you enjoyed Louise! 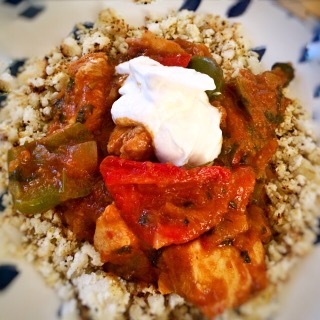 Made this tonight and it was so lovely – so much flavour! Just wondering if you could tell me where the 1sp comes from? Can’t suss it out! Made this last night . As I’d never made curry sauce from scratch before I had to go and buy a lot of the ingredients but I’ve got them now ! It was a bit of a ‘faff’ to make but instructions were easy to follow . I decide to blend the paste before adding to the rest of ingredients . It tasted really good , even my husband liked it and said it was much better than a ‘jar’ sauce .